The 2012, 2013 and 2014 Ford Fusion models have each been rated highly by the Insurance Institute for Highway Safety (IIHS) and the National Highway Traffic Safety Administration (NHTSA). Models from 2009 through 2011 were also given high ratings for safety: The IIHS named the car as a "Top Safety Pick" in 2009, 2010, 2011 and 2012, and a "Top Safety Pick Plus" in 2013. The institute determines a car's safety by testing how it responds to front-impact crashes, side crashes and rear-impact crashes. Fusion models from 2013 and 2014 feature an optional front-collision warning system, which alerts the driver if the car gets too close to the vehicle in front of it. The car features child-safe locks and anti-pinch windows, as well as latch locations in the backseat for securing a child safety seat. Pricing for the 2014 models ranges from $21,900 to $32,500. The Honda Odyssey is a safe pick for larger families in the market for a minivan. The vehicle has been an IIHS Top Safety Pick each year since 2008. The 2013 Odyssey earned a 5-star rating from the NHTSA. Since it is higher off the ground due to its size, it does have a higher risk for rollover than a sedan. According to the NHTSA, the risk for rollover is just under 13 percent. The vehicle does have a rollover sensor that triggers the side airbags to protect the passengers inside the car, according to the IIHS. The suggested retail price for the 2014 Odyssey is from $28,825 to $44,450. 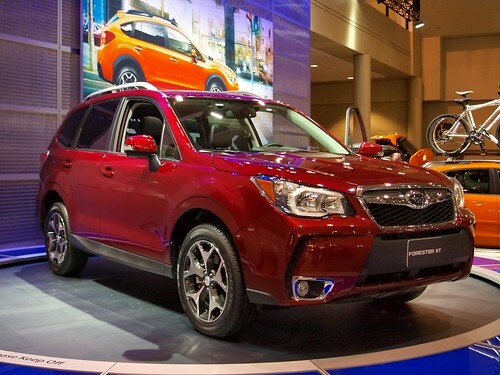 The IIHS named the 2014 Forester a "Top Safety Pick Plus." This small SUV was redesigned for the 2014 model year and now offers superior protection during side- and front-impact crashes. Like the Odyssey, the vehicle features a rollover sensor that sets off the airbags on the side. The Forester has a rollover risk of nearly 17 percent, according to the NHTSA. The 2014 model has optional front-collision warning and a lane-departure warning system that sounds an alert when a driver starts to drift into the neighboring lane. The suggested price range for the 2014 Forester is $22,995 to $32,995. The Toyota Highlander is a safe pick if you want a vehicle that's somewhere between a small SUV and a mini-van in size. The 2013 model of the midsize SUV was a Top Safety Pick from the IIHS and earned a 4-star rating from the NHTSA. The SUV was marked down a star because it has a higher risk for rollover than other models, according to the NHTSA. It also has a higher risk for head injuries, according to the IIHS. It does offer side airbags as well as a rollover sensor. For extra protection for the driver, there is a knee-level airbag in the front. When new, the 2013 Highlander had a suggested price range between $29,020 and $39,400. Families in the market for a used vehicle can find select models at DriveTime.com and other car dealers.